How does an art teacher do that when so much of our subject matter is ambiguous and subjective? Are there any absolutes? Could there ever be any "wrong" answers in an art lesson? For a long time now I have been trying to put together a picture of the "perfect" art lesson, one that combines practicing and mastering new techniques, learning about art history, deep thinking, writing, and discussion about visual communication, and authentic art production by students who are genuinely "expressing" some aspect of their lives and ideas. Students in art class should be creative and experiment, but I can't just hand the kids a bunch of art supplies and say, "be creative!" That is like a music teacher handing out instruments and saying, "make music!" No music would be made, just noise! Regardless of what I have heard others say, sometimes there IS only ONE right answer in art. color pencil 1-pt. 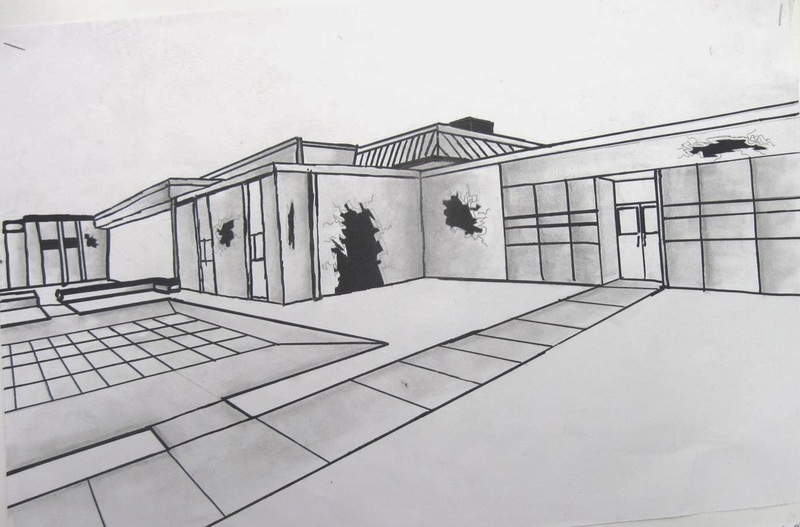 perspective drawing, 7th gr. Overlapping, size, and placement are used when creating a sense of depth. If students place all objects the same size side by side along a line at the bottom of the page, they are NOT showing any depth! Just like 1 + 1 = 2, when a student mixes blue and yellow paint the resulting color will be green every time. I recently came across the book Becoming An Art Teacher, by Jane K. Bates. She describes 3 different philosophies of art education; Closed-Ended, Open-Ended, and Laissez-Faire. She also gives examples of both effective and ineffective lessons for each one. These were ideas new to me, and they helped me understand my own approach much better. 1. CLOSED-ENDED; this type of lesson has lots of structure in order for students to develop skills, but the artwork tends to look alike because students follow strict step-by-step instructions. This is a great way to teach kids new techniques or proper uses of tools.....there is only one right answer. For example, when you are teaching linear perspective or how to use a pottery wheel the lesson would BEGIN as closed-ended. There are lots of ways for creative interpretation after the skills are learned, however. 2. OPEN-ENDED; this lesson style still has structure, but students have more freedom to explore and be creative. The students are given general guidelines for a project and they still learn skills, but they are encouraged to think of a different "right" answer so as to be creative problem solvers. For example, students can create designs that illustrate a variety of balance types. 3. LAISSEZ-FAIRE: this lesson type encourages experimentation with no criteria involved. For example, students are motivated to explore and discover on their own and there is a mindset of "process over product." This would be appropriate when students experiment with clay textures or mixing tints/shades. According to Ms. Bates, this would be inappropriate if the teacher just tells the students to "Be creative!" and then hands them a bunch of art supplies to "make something" for the art show. Most of my lessons fall in the middle. What about you? Below I have posted a few examples of rubrics from my colleagues. It is fascinating to me to see how other art teachers grade a project! Project incomplete or complete but shows no or little evidence of understanding. Project complete but basic skills need improvement. Some details missing or range of values needs work. Project shows adequate understanding of elements or art (values and composition). Evidence of some planning. Project Planned carefully. Elements of art used effectively to create a strong composition and values. Project is incomplete or finished with no evidence of experimentation. Project finished, but imagery/solutions not developed. No evidence of experimentation/originality. Project finished but original ideas not developed completely. Project finished with total originality after thorough experimentation. Shows a theme/strong design. Project unfinished or completed only after many prompts/ideas/physical help. Project finished with minimum effort. Met minimum requirements with no extra effort. Project finished with good effort in class but some details lacking. Project finished with maximum effort – on task in class daily and works independently. Project finished with no attention to detail. Project quickly thrown together / messy. Project finished but somewhat messy. Project fairly detailed. Minor flaws in craftsmanship present. Project detailed. Beautifully / carefully crafted. Very neat and careful. Student off task most of the time. Student sought ways to avoid work. Did not apply suggestions on how to improve work, or did not follow directions. Student did the bare minimum to complete the assignment. Minimal effort or distracted in class. Student stayed on task the majority of the time. Listened to suggestions on how to improve work and applied them. Student worked enthusiastically and applied suggestions on how to improve work. Student problem-solved creatively and independently. The collage shows considerable attention to construction. The items are neatly torn. All items are carefully and securely attached to the backing. There are no open white spaces. The collage shows attention to construction. The items are neatly torn. All items are carefully and securely attached to the backing. A few barely noticeable white spaces are showing. The collage shows some attention to construction. Most items are neatly trimmed. All items are securely attached to the backing. There are some big areas of white showing. The collage was put together sloppily. Items appear to be just \"slapped on\". Pieces may be loose or hanging over the edges. Construction of the image is unfinished. Face is drawn in correct proportion. The student is easily recognizeable. Face is drawn with mostly correct proportion. The student is easily recognizeable. Proportion on the face is not fully correct. You can mostly make out who the student is. Proportion on the face is incorrect. Student did not include parts of the face or neck/shoulders. Skin tone and shading on the face is excellent. It is easy to see where highlights and shadows are. Skin tone and shading on the face is good. It is fairly easy to see where highlights and shadows are. It could be improved. Skin tone and shading is not visible on all parts of the face. There are areas that need work. Student did not give attention to creating highlights and shadows for their skin tone. They just used random skin colors. Class time was used wisely. Much time and effort went into the planning and design of the collage. It is clear the student spent time working on this. Class time was used wisely. Student could have put in more time and effort. Class time was not always used wisely. Student could have put more focus and time into their work. Class time was not used wisely and the student put in no additional effort to get their project done on time. 1. _____ (5 points) Lines are cleanly erased because I drew lightly at first. 2. _____ (5 points) I used a ruler to make straight lines – they are very neat. 3. _____ (10 points) The lines of the hallway’s floor, ceiling, walls, lights, passageways, tiles, etc. recede to a single vanishing point. They DO NOT slant in random directions. 4. _____ (10 points) The horizontal and vertical lines do not look diagonal because I checked the position of the ruler against the sides and top/bottom of the paper. 5. _____ (5 points) The paper is smooth and wrinkle/tear free. 6. _____(10 points) The color pencil application is smooth, with no tiny white spots showing or messy lines/scribbles in the colors. I colored in one direction, not multiple directions. 7. _____ (5 points) There are a VARIETY of values and colors which range from very bright/light to very dark. 9. _____ (5 points) I UNIFIED the drawing by REPEATING colors and shapes and by BALANCING the colors. 10. _____ (15 points) The drawing is very interesting, original, and creative. Even though I drew the same hallway as everyone else, I thought of my own ideas for finishing it with colors, objects, characters, or additions to the architecture. 11. _____ (5 points) The drawing is finished, there are not any areas that are left unfinished. 12. 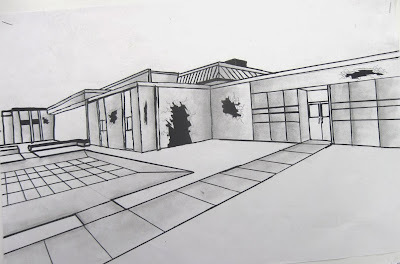 _____ (10 points) I took time to draw details in the hallway, such as “Exit” signs, wall tiles, lockers, etc. 13. _____ (5 points) I asked for feedback and/or help if needed. 14. _____ (10 points) I used all class time and wasted none by talking to my friends or cleaning up too early. 15. _____(5 points) The GRADE SHEET RUBRIC was turned in with the project. SHORT STORY (50 points possible):_____ (25 points): The student wrote at least 5 paragraphs, including an introduction, body, and conclusion._____ (5 points): The student named each of the characters. _____ (10 points): The student included a conflict or climax in the story. Also, the conflict is resolved in the final paragraph. _____(10 points): The student wrote neatly and legibly. How well does your clay sun or gargoyle show mood/expression? Place an X where you feel best and explain why. 4- Clay Sculpture shows a clear mood/expression. How creative or unique is the clay sun or gargoyle you created? 4- Clay sculpture demonstrates interest as a unique piece not copied from a pre existing art work. 3-Clay sculpture demonstrates interest and uniqueness with inspiration from an existing art work. 2- Clay sculpture demonstrates interest and uniqueness with a slight resemblance to an existing art work. How much detail has been added either sculpted and or painted? 4- Clay sculpture demonstrates a great deal of detail. 3- Clay sculpture demonstrates some detail. 2- Clay sculpture demonstrates little detail. How well crafted was the clay sculpture? 4- Clay sculpture was well crafted. 3. Clay sculpture had some problems. 2- Clay sculpture had many problems. I have large classes, too, the largest of which is 34. I know the teacher at Pinson Valley High has classes of 40! My biggest question about the TABS method is; HOW do you do assessments? I try to give my middle school students plenty of choices, but I don't have the space to allow them to choose their medium. For example, when we do still-life drawing, I ask them to bring small, personal items from home to set up their own "autobiographical" still life instead of having the whole class draw the same one that I set up. Then, I grade ALL the kids with the same rubric (space techniques such as overlapping, shading technique, neatness, accuracy.) We do pre-instruction drawing, too, so I can gauge where their skill level is and how much they have improved. I store their items in a ziplock bag until we are finished with the drawings; each class has its own box. When we paint, the kids choose the subject matter, too, even if it is between 2 subjects such as painting a flower or a skull in the style of O'Keeffe. Last year we had a workshop presented by an elementary school teacher (I think from Auburn) who chose to do TABS because she had been having so much trouble with discipline in her classroom. After she set up all her stations and trained her students, her discipline problems decreased. Why did you decide to go the TABS route? My assessment comes from daily participation grades, artists statements, and vocab tests. Daily participation is comprised of 100 points per week. I give the students 20 points per day if they produce/research art during the whole class period. If they work only half the period they get 10 points, and so on. Each Friday they have to complete an artist statement where they answer questions about their best artwork from the week. Vocab test cover terms, artists, styles, etc. that we go over in class. I use to grade artworks, but I found it impossible to say what was good or bad because art is so subjective. Rubrics help, but it still always bothered me. Grading on production makes more sense to me. As far as space goes, I do not have a lot either. I do not have stations setup, but have all cabinets and materials labeled. Students get their supplies, and take them back to their table. It is actually easier to store artwork using TAB, because everyone is not doing the same thing. It is hard to store 34 sculptures at once, but not as hard to store 5 sculptures, and 29 2-D works. Unfortunately we do not all have a class room as great as (the Jefferson County high school where I used to teach) and I set that room up for TAB. It is one of the best high school art classrooms in the state. I have almost zero discipline problems because I explain to the students that this is the only class where they will have a choice in what they do, what their assignments are, what the right answers are, and what their grade is going to be.This is the reason TAB cuts down on the discipline problems. I decided to do TAB because of a meeting I went to at the NAEA meeting in New York about 8 years ago. There was a teacher that taught in a choice based style, but she was not part of the TAB movement. I always say that meeting changed my life, or at least my art teacher life. I then started researching choice based art, and discovered TAB. I think that TAB has grown tremendously recently, and I really see it as the future of art teaching. Another reason I switched to choice based art is because most of my students are not going to be artists, so what I want to produce are creative thinkers that can think outside the box. Choice based art really forces them to do that. One reason all my classes are big (had 40 one time) is I told the administration that I wanted to combine all the art class levels. I have Art I, II, III, IV, and AP combined in my classes because I use the upper level students to teach the lower level students. We are on block schedule, and I teach all four blocks because we lost some of our electives when the economy crashed. It may seem scary to switch to tab, but once you start you will never go back. I have attached a powerpoint that I used to get the job at Daphne, and that I send to my parents at the start of school. The pictures in the show are from my Pinson class, so you can see how big and awesome that room is. (I teach choice-based art) Our grades are G,S,N,U so mine are mostly participation based. I do have a rubric, one for 1-3 and one for 4-6, that they have to fill out when they complete their artwork. I make them sign their work, mat it (construction paper), label it, title it, and fill out the assessment sheet. Then they turn it into a completed bin. I LOVE choice based. I still have some things to work through but it has freed up the kids to be more creative. Discipline is much better, however I have the lazy few that no matter what type of classroom just don't want to do and want to disrupt. However, they are few and far between. Most of my students love the new way of teaching because they can find their niche. I have one who refused to do anything until this year and he has spent the whole year weaving. He is autistic so it's a HUGE step for him!!! I love it, but will definitely make some changes next year, but mostly in the room setup because this is kind of a transition year for me.